On the cover: Takuya Matsuno, strategic planning managemer at Precision System Science, shows a demonstration sample of the firm's DNA chip. As Japan grays, its seniors will need high-tech assistance -- and companionship. For a young CEO of a cellphone-content venture, Cybird's Kazutomo Hori's approach to expansion is refreshingly cautious. AI entrepreneur Hideto Tomabechi works to integrate humans and machines in a "hyperself" architecture. Think you know Tokyo? Web artist Chigono will either confirm your familiarity or challenge it. This month: iBeam and FunMail. Has i-Mode Lost its Mojo? Or is it just the costly recalls, damaging delays, decreasing growth, and increasing competition? Biotechnology in Japan is hot among investors -- though not among foreign ones. Does this country have a good chemistry with the industry? 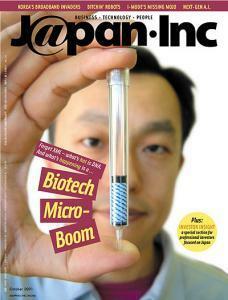 PLUS: Under the Microscope: a few interesting samples of biotech ventures in Japan. Last December, we told you that South Korea was zooming ahead of Japan in all things Internet. Now its battle-tested broadband ventures are invading -- you guessed it -- Japan. Can Japan's new real estate investment market live up to expectations? How do recent and proposed changes in Japan's investment regulations affect investors in Japanese companies? Nevermind dot-coms -- an increasing number of IPOs come from the restaurant industry. On wage disparities, car thefts, bargain burgers, and more.